It’s official, LendingRobot has partnered with Funding Circle to expand beyond consumer credit and into small business credit. Now individual accredited investors can invest in small businesses on Funding Circle’s marketplace through LendingRobot’s automated platform. 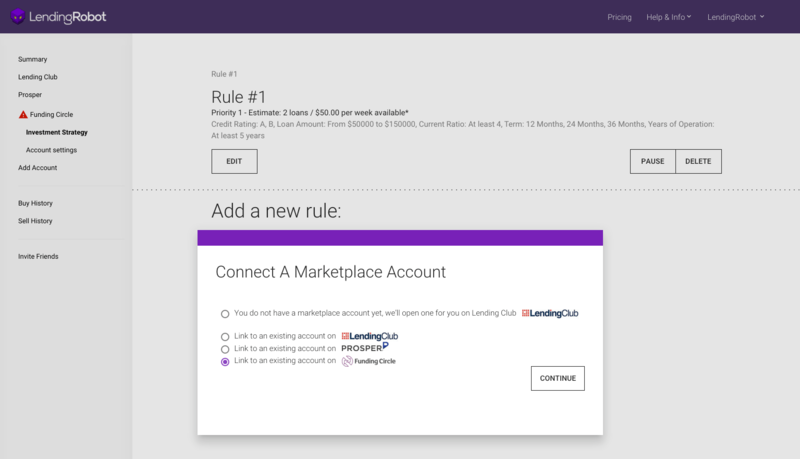 Through our integration, you can set investment strategies with loan filtering criteria for Funding Circle’s marketplace as well as your existing or newly created marketplace accounts supported by LendingRobot. As peer lending continually grows so too does the increase in the number and size of focused, vertical marketplaces. LendingRobot offers optimal performance in peer lending when investors deploy their cash over hundreds or thousands of different loans and across multiple marketplaces. Our strategy to diversify reduces risk while delivering returns that exceed the traditional fixed income investments. We’re continually making efforts to make marketplace lending accessible for all investors, making LendingRobot the single solution for robo-advising in well-established marketplaces. Our goal is to help our investors with a simpler way to automatically invest across diverse vertical marketplaces with our transparent analytics. Now that LendingRobot is open to any accredited individual investor, high net worth investors are able to utilize a robo-advising solution in the peer lending space. If you’re interested in having LendingRobot automatically invest your Funding Circle account, just link your Funding Circle account within your LendingRobot account. Let us know if you need help setting up!